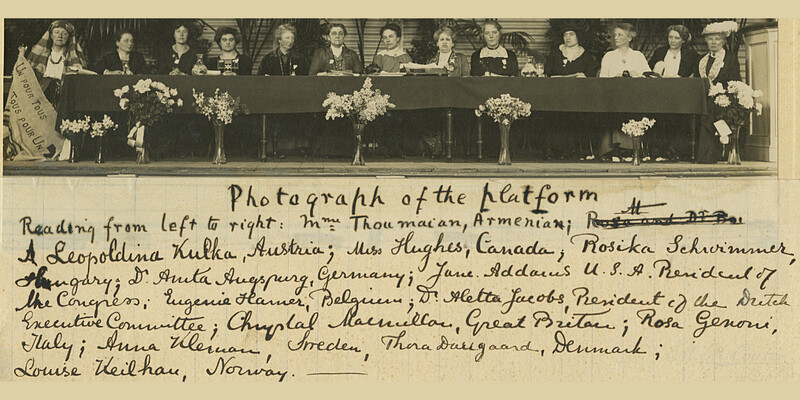 Seated at the dais on the 25th of April, 1915, were women from 13 countries who managed to travel during wartime to attend this conference and raise their voices for peace. Please read their biographies below. For speaking out for peace during wartime many of them were later shunned in their own countries. Read especially about the life of Mme. Thoumaian from Armenia, on the left, who appeared in traditional Armenian dress, one day after the beginnings of the massacres of Armenians in the Turkish-Ottoman Empire. At the Women’s Congress in The Hague, 25th of April 1915, Madame Lucy Thoumaian, born Rossier de Visme in Switzerland, appeared in traditional Armenian dress, one day after the beginnings of the massacres of Armenians in the Turkish-Ottoman Empire. Lucy Thoumaian had been active in relief work since 1893, when her husband, Professor Garabed Thoumaian, a Christian missionary, was imprisoned and tortured in his hometown Marsovan. Exiled to England, they established a shelter for Armenian orphans, known as ‘The Armenian House’, in their home in Chigwell in 1906. Six years later, Lucy Thoumaian initiated an ‘International Movement of “Every Woman” for Peace’. She stated in a Manifesto distributed in September 1914: ‘war is man-made - it must be woman-undone!’ After the Women’s Congress, Mme Thoumaian stayed in the Netherlands until November 1915. With the ‘Every Woman’ committee she distributed a peace plan, calling for a ‘Tribunal-Parliament’ of neutral states, international arbitration and joint peace-keeping forces. Through diplomatic channels, she also urgently appealed for tracing deported Armenians, in particular her 30 relatives in Marsovan. After the war, Mme Thoumaian became member of the Permanent Mandates Commission of the League of Nations, appointed under pressure from WILPF. Until her death in the US in 1940, she continued her campaign for international protection of Armenian victims of the massacres, on the basis of justice and forgiveness. Rosika Schwimmer was the delegate to the conference from Hungary and was a great friend of Lola's. Dr. Augspurg was one of the 28-strong German delegation at The Hague. She was also a member of the International Committee that organized the Congress. She gave a brilliant speech in the debate on Resolution 8: Democratic Control of Foreign Policy, when she spoke up for her conviction that if people could vote on the question to start a war or not, they would firmly decide against war. Along with other women peace activists she set up WILPF Germany immediately after the congress. Amongst the political atmosphere of nationalism and militarism in Germany during the 1920s, the section established itself as a radical peace and feminist organization. In theearly 1930s there were than 2,000 members in almost 100 towns and smaller places. In joint actions they campaigned for equal political participation of women, claiming peaceful solutions of conflicts and enduring peace and freedom. With her partner Lida Gustava Heymann she founded the pacifist-feminist newspaper "Die Frau im Staat". In 1933 both women emigrated to Switzerland due to the rise of Hitler. After 47 years of a lasting relationship and still in exile Anita died in December 1943, only five months after Lida Gustava. The first half of her life was spent building a caring institution in a poor immigrant section of Chicago: the second half, of understanding and seeking a way to end the violence of World War One. Born into a well to do family in a small town in Illinois, she had big dreams: to do something useful in the world. Supplementing her dreams with hard work, she became a pioneer American social worker, public philosopher, sociologist, author, and leader in women’s suffrage and world peace. Jane Addams was chosen to preside over the three day Hague Conference of 1915. This was a potentially chaotic event, with many languages, no simultaneous translation and no microphones. She did it with a skill that gained her universal acclaim. Jane Addams was awarded the Nobel Peace Prize in 1931.